With the PCI Compliance App for Sumo Logic, you can meet evolving PCI requirements without the data hassle or the burden of self-policing. Easily meet your audit requirements with scheduled and ad-hoc log searches. Rapidly discover and visualize data patterns to demonstrate PCI requirements. Proactively monitor all infrastructures in real-time for indicators of security breaches. PCI is an essential part of strategy for any organization handling customer billing information. For those who handle thousands upon thousands of log messages with potentially sensitive data, this can be an overwhelming task. PCI compliance standards have undergone substantial changes, and PCI compliance audit logs can be unpredictable, with auditors requesting precise information related to an organization’s operations. The Sumo Logic PCI Application is built to help businesses overcome the PCI compliance challenge. Ready-made dashboards monitor every aspect of PCI compliance while targeted searches allow you to dive into specific areas. Intricate ad-hoc reports give you automated visualization capabilities that make your job easier. Instead of using manpower to look through millions of log lines, Sumo Logic watches over your deployment, making potential problems easy to spot. 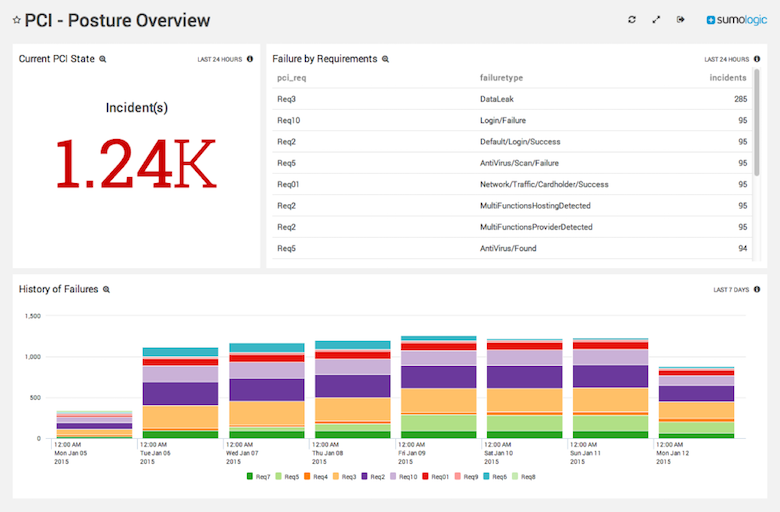 The PCI compliance app from Sumo Logic indexes PCI data into a custom view. This indexing allows for quicker search results against your data. Businesses use their view to search PCI Requirements and create PCI Dashboards. Sumo Logic’s application for PCI compliance reduces the burden on IT resources and increases productivity while helping your organization demonstrate a strong PCI DSS posture. Industry-leading automated and built-in machine-learning algorithms drive proactive analytics to detect critical events without depending on rules, queries or human input. With Sumo Logic, you can successfully and easily execute end-to-end machine data analytics and future-proof your investment through a cloud-based service that adapts to changing data types and compliance needs. This PCI app is an extension of our security analytics capabilities, including machine data intelligence, pattern recognition, and unique anomaly detection capabilities that enable you to find things you didn’t even know to look for. Learn more about the Payment Card Industry Data Security Standard (PCI DSS) requirements and how the Sumo Logic app can help.